The composition of the extraction buffer (10 mM HPO4/H2PO4, 1.5 mM EDTA, 3 mM NaN3, 10 mM monothioglycerol, 10% v/v glycerol; pH7.5). High-speed centrifugation, resulting in particle-free extracts, is preferred over low-speed centrifugation. The cytosol protein concentration should not be less than 1 mg/ml. The minimal purity of the radioactive ligands should be 95%. 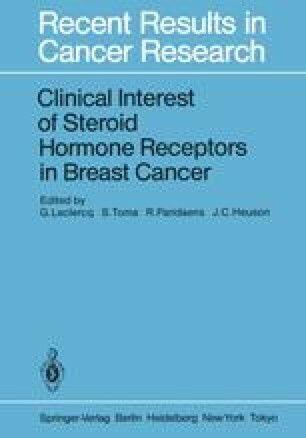 The recommended ligands for the ER determination are estradiol and moxestrol, while R-5020 or Org-2058 should preferentially be used for the progesterone receptor (PgR) assay. The nonspecific binding is to be determined in the presence of a 100-fold excess of unlabeled diethylstilbestrol for the ER assay and R-5020 or 0rg-2058 for the PgR assay. The charcoal adsorption technique combined with Scatchard analysis was to be retained as the standard procedure. The receptor concentration is expressed as fmol/mg protein. Protein is measured according to Bradford , using Kabi human albumin as a protein standard. The Coomassie-blue reagent is obtained from Bio-Rad.